Just what the Maryland Republican Party didn’t need — a theocratic, paleo-conservative candidate who has renounced the General Assembly as ungodly and is deeply involved in a group advocating a white, Christian nation of the South. Worst of all for the Maryland GOP, this 61-year-old, Bible-spouting secessionist with a bizarre view of government is the favorite to win the November election in Anne Arundel County’s Broadneck Peninsula-Severna Park-Arnold councilmanic district. His name is Michael Peroutka, a smooth-talking, debt-collection attorney. He ran for president of the United States in 2004 on the Constitution Party ballot line. He got 150,000 votes out of 122,000,000 cast (0.1 percent). Yet in June, he shocked the GOP establishment by winning Anne Arundel’s District 5 council primary by a razor-thin 38 votes. Like the slick lawyer he is, Peroutka is trying to sweet-talk Council District 5 voters into believing he’s an ordinary conservative who rails against the misnamed “rain tax,” abhors all taxes and demands drastically limited government. Peroutka didn’t even belong to the Republican Party until this year. He and a Christian Reconstructionist cohort, David Whitney, tried to hijack the District 5 election by seeking to win both the Republican and Democratic primaries. That would have guaranteed a seat on the County Council for this oddball alliance, which centers around Peroutka’s extreme Christian Institute on the Constitution, which he runs out of his law office in a strip shopping center along Ritchie Highway. Peroutka is out to re-create the Anne Arundel Republican Party, and eventually the Maryland GOP, in his image. His pseudo-conservative rhetoric masks a deep hatred for the Republican Party of Lincoln, Ronald Reagan and George W. Bush. Peroutka isn’t even following his own advice. Instead, he’s infiltrated the “Godless, unprincipled” GOP. Any other government actions — what he calls “pretended laws” — are heretical and should be ignored or resisted. No wonder he spoke at a radical Second American Revolution rally last November in Washington. He’s out to dismantle the entire American system of government. He said last year the Maryland General Assemby is “no longer a valid legislative body” and its actions should be disregarded because they violate God’s law. According to him, “It is not the role of civil government to house, feed, clothe, educate or give health care to . . . ANYBODY.” Government, Peroutka says, has no authority to take any role in education or alleviating poverty. Government must enforce only the word of God spelled out in the Bible. Peroutka doesn’t come across as a madman. He’s got a distinguished mane of white hair, a grandfatherly look and a soothing voice. How could someone so sincere and seemingly erudite promote such nonsense? Peroutka is a board member of the League of the South, an Alabama group that openly advocates Southern secession and establishment of a white, Christian Reconstructionist society. At this group’s meeting last fall, Peroutka called “Dixie” the country’s national anthem. Should Michael Peroutka win in November, he’s sure to use County Council sessions as a platform for bringing his theocratic notions of government into the proceedings. It will be his launching pad for an internal Republican Party revolution. Just what the Maryland GOP didn’t need. It already is struggling for relevancy in the state’s largest jurisdictions. Peroutka’s ravings as an elected Republican leader could be the nail in the coffin for the Republican Party’s hopes of winning over independents and conservative-leaning Democrats. Stopping him will be difficult, but not impossible. District 5 hasn’t elected a Democratic councilman in 24 years. It’s a wealthy, conservative part of the county stretching from Severna Park to the Broadneck Peninsula that ends at the Chesapeake Bay Bridge. Yet there’s hope in the voter registration numbers: 25,800 Republicans live in the district against 21,100 Democrats and 11,600 independents. Given the GOP leadership defections already announced, Peroutka’s election isn’t a sure thing. He’s got millions of his own money he can funnel into his campaign, though. He’s running against a political youngster, Patrick Armstrong, a 31-year-old retail store manager who entered the Democratic primary to prevent Peroutka’s theocratic colleague, David Whitney, from furtively gaining the nomination. Armstrong did better than okay in the primary. He trounced Whitney, gaining nearly two-thirds of the Democratic vote in June. He’s also not, as he put it, “a liberal boogie man. I’m a reasonable person” who grew up in District 5, graduated from Anne Arundel Community College in the district, and lives with his parents in Cape St. Claire. He’s also wise enough to recognize that opposing the “rain tax” isn’t going to win over district voters who care deeply about the well-being of the Chesapeake Bay and its tributaries, including the Magothy and Severn rivers that define District 5’s boundaries. With strong backing from state Democratic leaders, Armstrong might give Peroutka all he can handle. But he’s got to get the word out about Peroutka’s dangerous views of government and the U.S. Constitution. After all, Peroutka is advocating the dismemberment of the United States and turning what’s left into a society ruled by Biblical law. 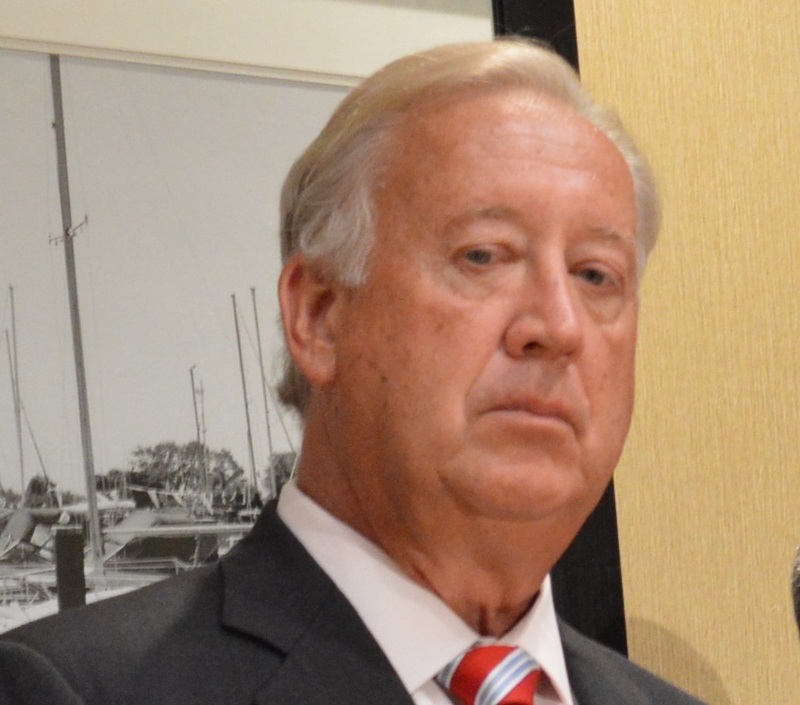 The problem is that even if Peroutka’s Republican charade is unmasked in time and he loses in November, he will remain the Maryland GOP’s nightmare: In June, he also won for himself a seat on the Anne Arundel Republican Central Committee. That gives him an opportunity to use the county’s GOP Central Committee as a launching pad for converting Republican governing bodies into advocates for Christian government. As a central committee member, Peroutka also will attend statewide GOP meetings, where he can poison the well with radical resolutions and speeches meant to Christianize the state party. He’s leading God’s crusade against the Republican infidels. On top of that, another Peroutka theocratic soulmate, Joe Delimater, was the lone GOP candidate to file for county sheriff. Delimater will be on the November ballot against Democratic incumbent Ron Bateman, hoping to win the right to wreak havoc on Anne Arundel’s court and criminal justice system by ignoring laws and government orders he believes are Godless. What a mess for the GOP. Peroutka & Co. pose a serious challenge to the viability and future of the Maryland Republican Party. The House of Delegates overwhelmingly approved a tax cut in Friday’s session that would benefit Maryland’s millionaires after they die. In a 120-13 vote, the House voted to exempt more assets from the estate tax, which taxes a property of a deceased individual if it’s valued at $1 million.